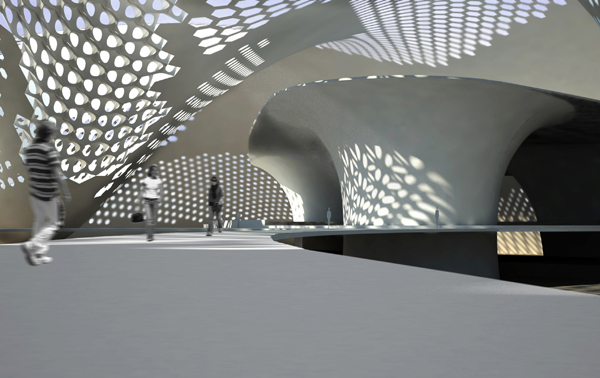 When we think of architecture we dwell on place on dimensions of soaring forms creating a volume of space. We don’t interpret shape within us in the same fashion. We should. Surrounding our world is the space net of a web within gravity. 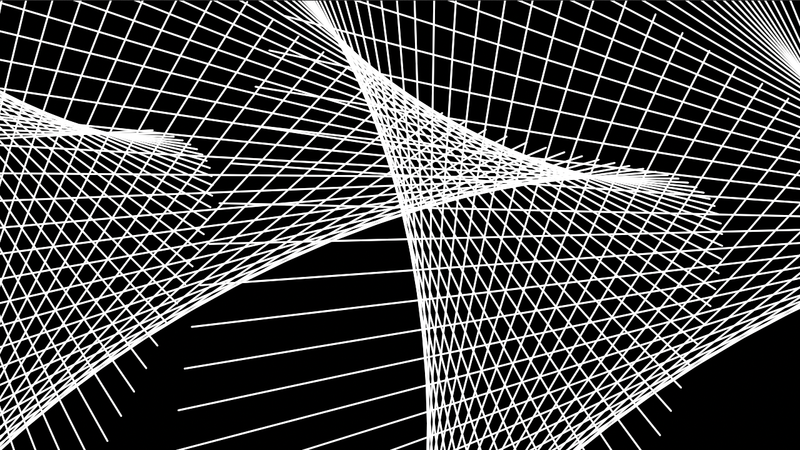 If we could perceive lines as force flow we would view the flow of attraction between masses that fills the space. But we can’t see this web. We only know it is persistently filling all volumes of space. 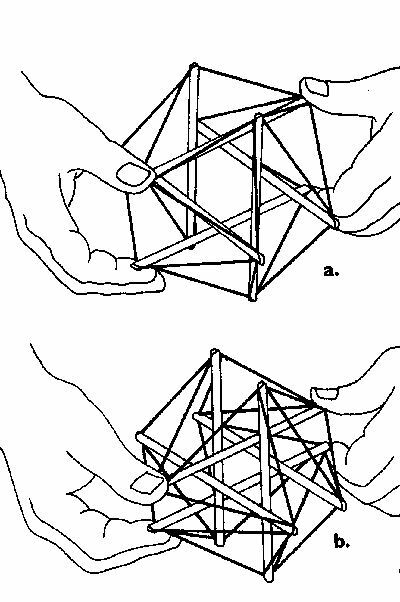 As we twist a model of tensegrity comprising struts and elastic cords between in our hands we immediately grasp the self rotation aspect within this structure. Perhaps it’s the springiness of the overall shape. Accidentally drop the tensegrity object will bounce as it hits the floor. But the elastic twisting is a design feature that in effect centers the floating tension object. Twist it around and it literally springs back into its original shape. This is how Nature builds things. Our bodies are examples of floating tension/compression balanced muscles and bones, articulated to perform in motion. But we live in a gravity field. We move with smoothness and elegance. Jerky at first as a child swings its arms over its head to maintain balance these are the first steps each child will master. We are all children playing in a gravity field. 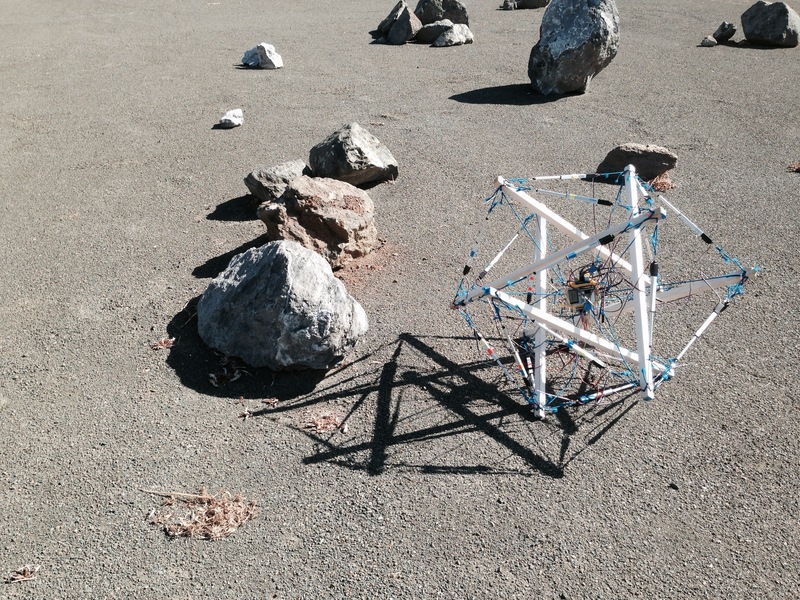 NASA is testing tensegrity designs at their Intelligence Systems Division located at the AMES Research Center to roam the surface of Mars as tension changes within the cables permit the robot to roll around on its axis, just like a child’s toy. NASA describes the device as, …..” the integration of biomimetics to tensegrity structures.” The device is a project of the Berkley Emergent Space Tensegrities (BEST) Robotics program affiliated with the Department of Mechanical Engineering UC Berkley with doctoral students Andrew Sabelhaus and Kyunam Kim including five masters students, Justino Calangi, Yangxin Chen, Eric Cheng-yu Hong, Yuejia Liu, and Dizhou Lu. Tensegrity robots are composed of purely tensile elements balanced to compressive components as cables and rods which these students have designed as actuators linked with control components including particular strategies for control. Our own bodies employ just such floating tension/compression a la Snelson tesegrity sophistication each time we swallow a bite of food or yawn. 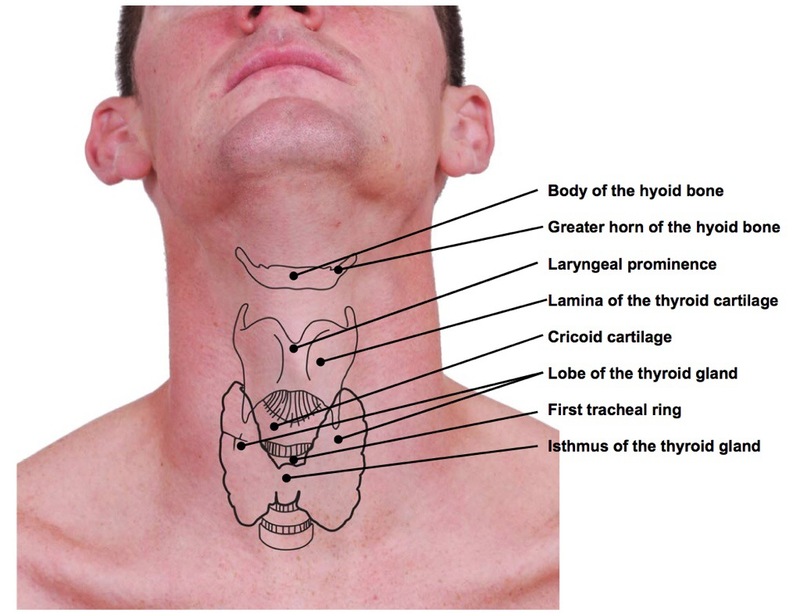 During any swallowing activity, the hyoid bone, tongue, and voice box, the larynx, together move upward rapidly. During a yawn there is a lowering of the thyroid cartilage and hyoid bone that is absent during simulated yawning. Simultaneously both of the eustachian tubes open up, lowering hearing acuity briefly. The larynx returns to its normal position. All facial muscles come into motion during a yawn sequence. The small red structure in this animation is the hyoid bone in isolation the only bone of the body that ‘floats’. But what is a floating bone doing in our neck? 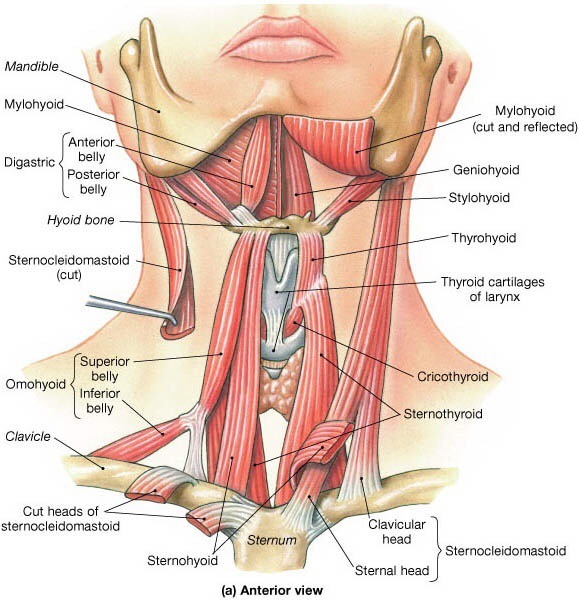 The hyoid is at the gateway to control food getting into our esophagus. If the structure does not open/close properly food can get into the windpipe so we choke. Also as we yawn the hyoid bone reacts as a motion but not when we take a deep breath. Hmm that sounds interesting. Let’s look at the anatomy. How is the hyoid bone attached to be able to ‘float’ ? Within a specific muscle centering arrangement. This anatomical design position revealing the ‘floating’ hyoid bone is beginning to take the appearance of tensegrity components in terms of muscular attachment of cables and rods or muscles and bone. 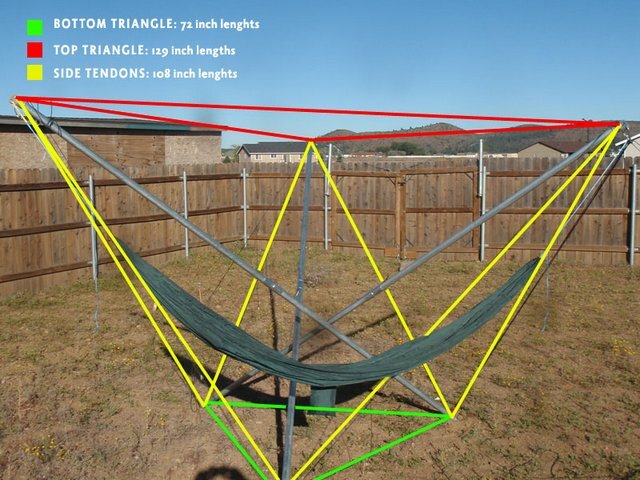 To get an idea of such an arrangement lets look at a tensegrity hammock design. Now if you were to consider the hammock as a rigid object you might begin to see how this rigid hammock might float within its support network of cables and rods or bone and muscles. The hyoid bone has the appearance of being a miniature version of a jaw without teeth. But the metabolism of bone is special the shape is changing in time. The shape we can track as changes in measurement. The dimensions of shape afford bone to allow us to see Nature in her design matrix. Time slows down with analyzing bone. The changes are at a pace more serene to the tune of abrupt receptor changes within smaller molecules at receptors. No longer the time frame of milliseconds for those other abrupt changes now we view through the looking-glass of time itself. The passage of time dependant upon gravity at the crux of Natures power. But the key terminology is ‘floating’ as a suspended object in motion. If you were able to interact with a tensegrity object you would feel the balance of elasticity within the structure holding the cables and rods/ bone and muscle together, just the way Nature suspends the hyoid bone. Just like the lady above feeling the balanced tension/compression of a 6 sided tensegrity object allowing the elastic motion to spread across the entire structure returning to its original configuration after a distortion. 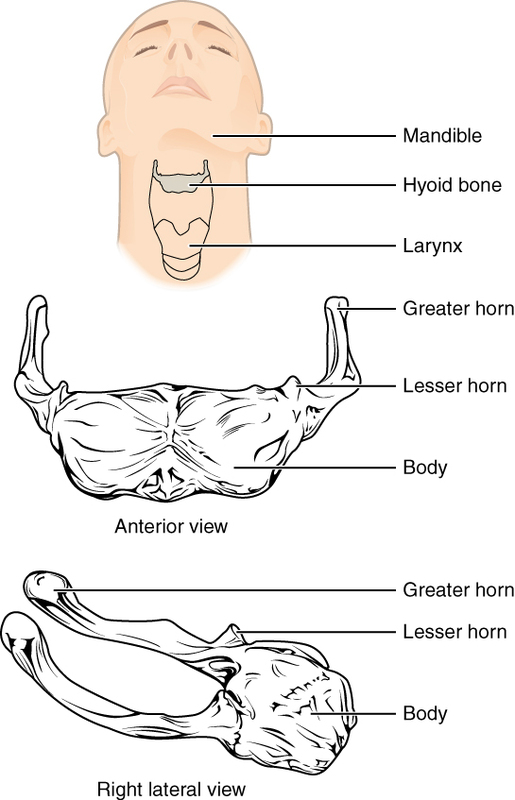 There are various wonderful animations on the motion of the hyoid bone. But swallowing also opens the eustachian tube to the middle ear to equalize inner ear pressure. The hyoid bone is intimately linked into the middle ear bones that control the vestibular system also. The relationship of building such structure from a design imperative is the timeline from the embryo how the anatomy forms into its final shape. But there is a complete structure of bones and muscles the struts and cables that describe the tensegrity accomplishment. 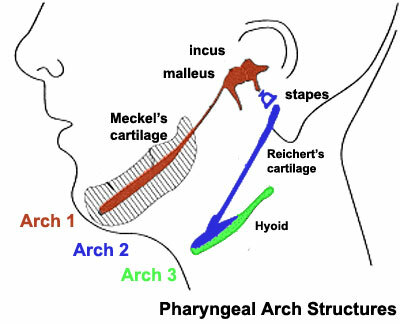 “The cavity within the pharyngeal arches forms the pharynx. But I will draw your attention to the various cranial nerves as the embryo develops in time. The nerves are cranial nerve (CN) V trigeminal, involving bones of the mandible, maxilla, malleus, incus, facial CN VII, stapes, styloid process, lesser cornu of hyoid, upper part of body of hyoid bone, glossopharyngeal CN IX, greater cornu of hyoid, lower part of body of hyoid bone, superior laryngeal and recurrent laryngeal branch of vagus CN X, thyroid, cricoid, arytenoid, corniculate and cuneform cartilages. Also involved with tongue motion are the cranial nerves XI and XII, the accessory nerve and hypoglossal nerve for the shoulder and neck muscles. 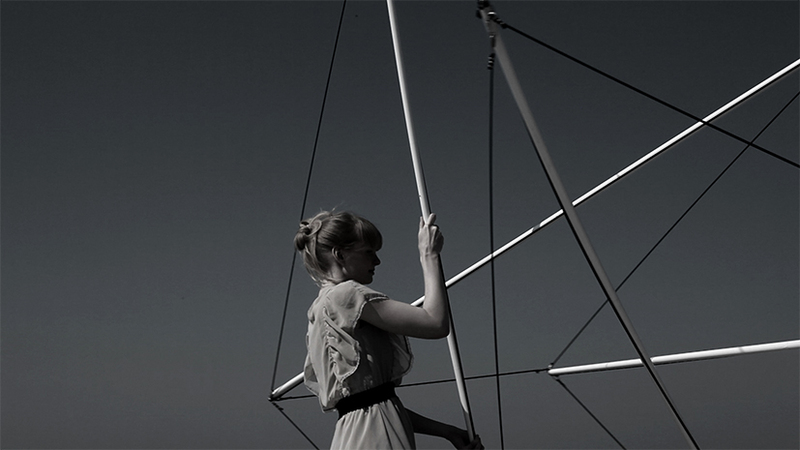 Cables and struts that rise and fall elastically back into position tensegrity style. This ‘floating’ bone the hyoid suddenly connects into the vestibular apparatus as part of the tensegrity network of tension/compression from bone to muscle from cables to rods. Here’s where things get totally interesting. As we yawn all of theses cranial nerves are involved CN 5,7,9,10,11,12 plus the action of cervical nerves C1-C4 the phrenic nerve and dorsal nerves innervating the intercostal and diaphragm as accessory breathing muscles. So what does the hyoid bone motion reveals, is that this bone flexes into a position into the vestibular apparatus unique to the yawn the entire facial, neck mouth opening involving the tongue muscles. What function might this entire elaborate elastic motion accomplish ? What field are we playing in: becomes the pertinent question to ask at this point? We are playing in the field of gravity. During filming of the movie GRAVITY starring Sandra Bullock the illusion of antigravity motion in space was created by suspending her mass on cables with registration dots along her body that are used to position her as if ‘floating’ in space, digitally erased by software algorithms. The yawn harmonizes our inner system of interoception within the yawn motion into the field of gravity. A yawn is therefore the reflex to orient to Earth’s field of gravity. When in space astronauts don’t yawn, they are surrounded by antigravity termed microgravity. Their reflex to orient to the vector of gravity crashes. Their hyoid bone in time will change shape in the process of inner osteoporosis, as the bone density ages more rapidly, the hyoid bone reveals the new shape of bone loss due to the absence of a gravity field unable to move properly to calibrate to the vector of gravity using all those cranial nerves that operate a tensegrity yawn. A final small observation from the journal Scientific Reports 3, Article number: 1340 doi:10.1038/srep01340 on a smaller scale of life in antigravity/microgravity environment. “The microgravity environment during space flight imposes numerous adverse effects on animal and microbial physiology. It is unclear, however, how microgravity impacts those cellular interactions between mutualistic microbes and their hosts. Here, we used the symbiosis between the host squid Euprymna scolopes and its luminescent bacterium Vibrio fischeri as a model system. We examined the impact of simulated microgravity on the timeline of bacteria-induced development in the host light organ, the site of the symbiosis. 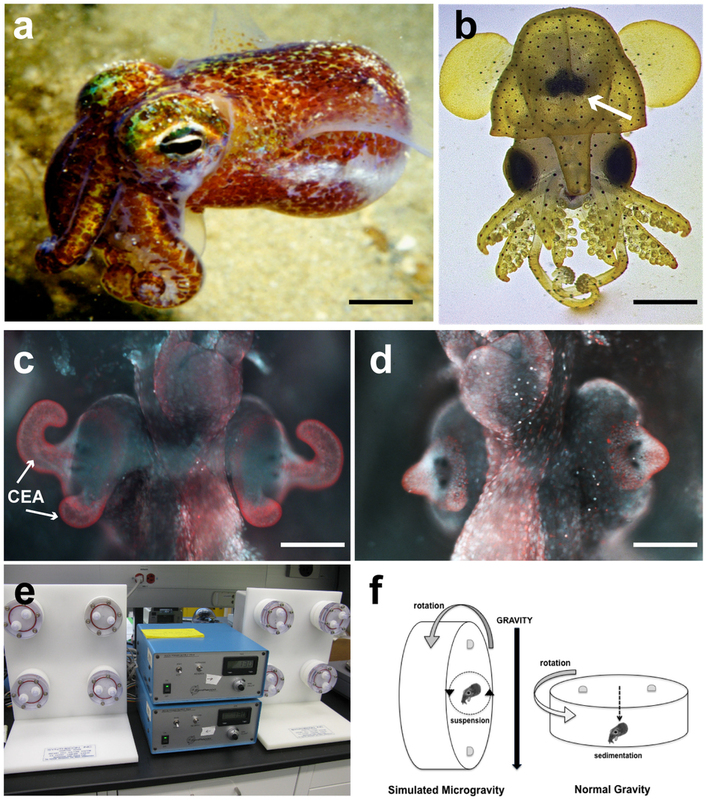 To simulate the microgravity environment, host squid and symbiosis-competent bacteria were incubated together in high-aspect ratio rotating wall vessel bioreactors and examined throughout the early stages of the bacteria-induced morphogenesis. The host innate immune response was suppressed under simulated microgravity; however, there was an acceleration of bacteria-induced apoptosis and regression in the host tissues. These results suggest that the space flight environment may alter the cellular interactions between animal hosts and their natural healthy microbiome.” Redirecting the gravity force field alters the functioning within the immune system. According to physician Olivier Walusinski and Professor of Ethology Bertrand Deputtein their report Yawning: its cycles, its roles, ” At awakening, the yawning and stretching open the pharngo-larynx (via motion of the hyoid) to its maximum to activate the return of muscle tone (loss of tensegrity floating tension) at its maximal from paradoxical sleep which then increases cardiac frequency, blood pressure, muscle metabolism, all associated with a loosening up of articulations. “ Tension/compression spills back into the system rising vertically within the gravity field to stand up erect stepping away from the horizontal bed. The reflex of the hyoid bone rising and falling within the activation of the cranial nerve web CN 5,7,9,10,11,12 of the tensegrity yawn gives us the opportunity to observe tensegrity in action, responding to the circadian rhythm of inducing alertness harmonizing to the gravity vector that is our constant direction within the gravity force field we live in. But what is the relationship to concussion ? Following head injury depending on the severity of the head deceleration injury both swallowing and word pronunciation are affected. Those Cranial Nerves 5,7,9,10, 11 and 12 are revealed to be uniquely vulnerable to the outcome of the concussive forces. Swallowing and pronunciation are the defective tensegrity motions of the hyoid bone in its up down elastic range of motion of cables and struts muscles and bone. What also is implied by this distortion within the shape flow of the hyoid is the loss of the yawn reflex indicative of the vulnerability into the attachment within the vestibular system. The yawn sequence is now forced into a reduced frequency, defective in its search for the calibration direction to the gravity field as if in antigravity, with no direction for the gravity field. Hence concussions affect the yawn reflex as the sensing into the gravity field is injured.